In Stores This Week: Madness Returns and the Chitauri Strike! August 8, 2012 - It's Wednesday, that magical day of the week when Diamond Comics ships comics and toys to good little comic shop customers across America. Which means it's time for the latest products from Diamond Select Toys! This week we get the last Marvel Select Avengers figure, and the first series of figures based on Alice: Madness Returns! First up, American McGee's take on the Alice in Wonderland story, as seen in the award-winning game Alice: Madness Returns, is now a line of Select action figures! 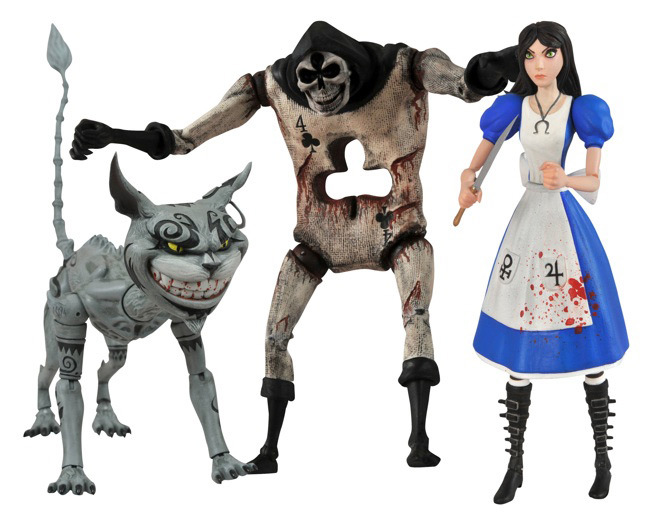 The first assortment of 7-inch scale figures features the Cheshire Cat, a zombie Card Guard and Alice Liddell herself, complete with Vorpal blade, hobby horse and pepper grinder. And if you're lucky, your local shop also ordered in the Previews-exclusive Hysteria Alice, featuring Alice in her unstoppable Hysteria Mode from the game.